Shopping in Vietnam — many web stores have been appearing in the recent years. The most convenient, English language e-commerce site is Lazada. Here’s a guide! In Vietnam, online retail is still comparatively new phenomena but a constantly growing one as such. More and more Vietnamese companies are going online and penetrating the internet market with Lazada, the forefront of modern e-commerce. Now with the Marketplace feature — Lazada has joined forces with online retailers throughout the country as a dominant seller portal giving visibility to anything from small to midsize businesses through it’s popular seller features. The 2012 launched Lazada Group is operating in Vietnam, Thailand, Singapore, the Philippines, Malaysia, Indonesia — six countries in total. While other shopping sites remain, it is still the only one that supports foreigners with an English language user interface. Other popular shopping portals in Vietnam include sendo.vn, tiki.vn and adayroi.com — now all joint with investors, competing for the top position in Vietnamese e-commerce. According to estimates third of Vietnamese are going to be online shoppers by 2020 — a country with a population of 90 million. The future of Vietnamese e-commerce will be a bright one indeed. To open up the English interface, please use the provided link on top of this page. However, do note that product descriptions are left in Vietnamese for the most part. You may either try to cope with it or use different translation methods to understand the rest of the contents. Do note that all the important parts for purchase and ordering will be in native English. For translations either (1) use Google Translator for copy/pasting important parts or (2) use Google Chrome to do a live translation of all the pages as you browse the website. I am happy to answer all questions about shopping in Vietnam! Simply leave your comment below. Thanks! Despite having completed some sales with Lazada, I cannot find a website in English and all have no visual link to change language. I am now frustrated with the company and ready to close the account when possible. Emails to me are unreadable unless translated. If Lazada requires more business they need to redress this problem. 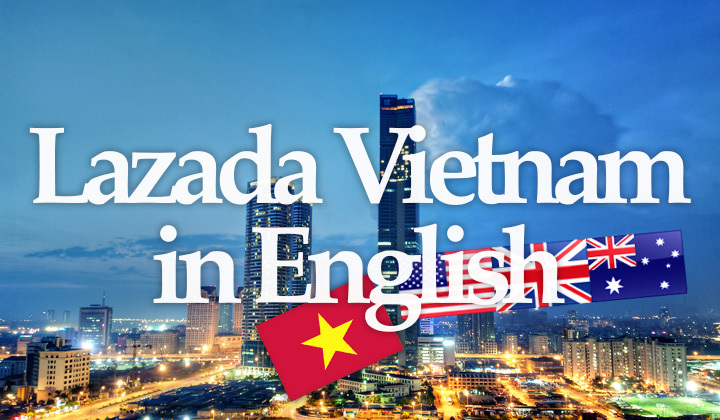 Sorry to hear that you are having problems; the link on top of the page should take you directly to the English version of Lazada Vietnam. Please try this link — and try to open it a few times in case it doesn’t work. Its works well to buy in Vietnam and deliver in Vietnam! The link on this page does take you to the English landing page of Lazada VietNam. Unfortunately much of the rest of the website is in Vietnamese. But you can use http://translate.google.com for rough translations. Still, it is still a good excise to fly to Singapore or HongKong to shop. Lazada is an on-line sales outlet. My experience with them is good (their ultimate ownership is a well-known Chinese outfit. They have no store, anywhere. Their website advises time to delivery for each product. They deliver anywhere couriers go – which is almost everywhere in VietNam. The biggest pain is having someone wait for delivery. And standby for a confirming SMS (English code is Answer-Pause-0-Pause-1) Pauses are 1 second. Miss the SMS and they will cancel order! AND CAN YOU SENT TO USA ?